Are you tired of the same old sketchbook that isn't even formatted for traditional manga? Wouldn't it be nice to have a book you can use for manga art OR traditional comic book art? Then, "Blank Manga Book for Boys 2" is your solution! 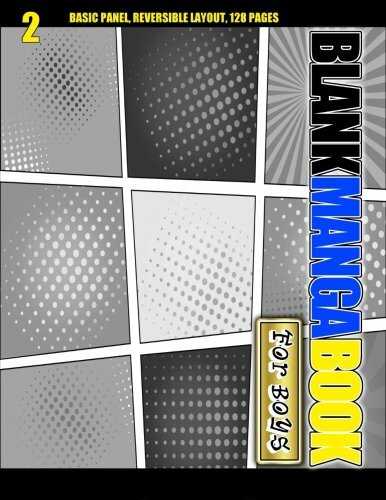 "Blank Manga Book for Boys 2" is an 8.5" x 11" reversible formatted book with basic panel shapes. The large book provides plenty of space and freedom to draft your ideas and create detailed landscapes for potential graphic novels. Whether you're perfecting your artistic expression or drawing your first manga comic, this book has all you need! Note: This book is intended as an idea and design sketchbook, not for final work. Scroll up & Click the Buy Button to Start Drafting Your First Manga Comic Book TODAY! Collect the Entire Series of Five Manga Books!